So I did it. Just like I said I would. I read The Ice Cream Theory from cover to cover as promised on my November vacation. Then of course, I delayed in posting, because I seem not to be able to finish things lately. Steff's book is the ice cream version of Candy and Me by Hilary Liftin. For a sweet lover, both books are worth the read! Timely or not, this review falls nicely after Tina's post about the Which Flavor Are You? Quiz. Steff's takes the ice cream personality to a deeper, quirkier, and wonderfully anecdotal story for the ice cream lover. This was definitely a quick and engaging read. Steff Deschenes seems to have a passion for ice cream that seems to be only paralleled by Scoopalicious! Ha! Steff is an ice cream fanatic who successfully uses ice cream as a metaphor of her relationships. The Ice Cream Theory is part memoir, part analysis of human nature. I loved the Pistachio chapter. I thought that the relationship between Deschenes and her grandfather was absolutely -- shoot, I can't even come up with the right word for it. It wasn't precious or endearing -- that's too belittling. It wasn't wonderful. That doesn't say enough. It was special, but so much more. I might have to say it in more words than one, which I guess I just covered. Not such a fan of the Chocolate Raspberry Truffle chapter. I love ice cream. Love it. Yes, I know we are human and therefore do things like vomit once in a while, but I do not need to have it in the same sentence as ice cream. I just don't. And look. Now I did it myself, put the two in the same sentence. Sorry. One complaint is I would love to know the ice cream places and ice cream brands she raves about. As I sat reading about the ice creams she absolutely adored, I wanted to know where to find them. However, though a directory of ice cream places wasn't included in the end of the book, I found some solace by visiting The Ice Cream Theory website. There you can see the charming Steff give video reviews of some ice cream places on location! To celebrate the release of her book, she visits all ten ice cream places in her town! Ten ice cream spots in town? I need to move there! Also, Portland, Maine fans can listen live to an interview with Steff this Tuesday, April 6th at 8 in the morning on the Q Morning Show (that's WJBQ 97.9). For those of you not in Portland's broadcast area, you can listen live via the web! Late reading this post and April 6th has come and gone? Not to worry! Visit the website to listen to a podcast! With six nominations/wins to it's name, numerous positive reviews (see here for them all), The Ice Cream Theory is not to be missed. Fun Quiz....What flavor are you? So fun and interesting. They say what you eat says a lot about oneself and I think for ice cream that is true. It would be really neat to hang around an ice cream stand for a day and listen to what people order than observe their mannerisms. Is the person who ordered Maple Walnut straightlaced? Does the Moose Tracks person seem adventurous? Who knows. 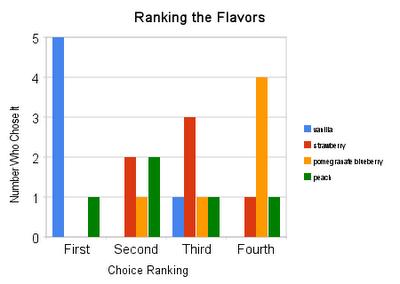 But I think its so true that certain types like certain flavors. I probably would have thought that this quiz is about being like the characteristics of your favorite flavor but it actually calculates what kid of ice cream you are like. This is pretty cool because I think the flavor I ended up being like describes me in a way (i think at least! But for the record its not on my favorites list of actual flavors). QUIZ...So what flavor are you? The true sign of Spring..Ben & Jerrys FREE cone day! Tomorrow, March 23rd, Ben & Jerry's will celebrate their 32nd Annual Free Cone Day just to say thanks. Stop by participating shops on the 23rd from noon til 5pm and grab a free cone. Hopefully the weather is as good as the ice cream to enjoy! Lucky you, readers! I am catching up on a bunch of posts that have been queued on my agenda for a while -- posts to which I haven't had the time to commit the full focus they deserve. Mid last summer, I got an email from a PR firm that represented Supervalu. They asked us if we wanted samples of Stone Ridge Creamery Tart Frozen Yogurt and Culinary Circle Chocolate Truffle Gooey Fudge Brownie Ice Cream Dessert. Um, yeah! Like many readers, she was taken with the guest post by my husband, Kevin, who had written about his astronaut ice cream. I told Kev we would be getting samples in the mail, but since he was such a hit as a writer and analyst, he would have to co-write this blog with me. However, since we can't seem to coordinate our schedules, he'll be following up with Part 2 in the near future). Coincidentally, the samples arrived on a Thursday that kicked off a long weekend in Vermont with my parents, my older sister and her husband. I packed up the frozen treats and the dry ice in a cooler and we drove up to Vermont. When we got to Vermont, we opened the door and flipped the light switch. Nothing. My first concern was in fact, my cooler of ice cream and no power. We decided to put the frozen goodies in the freezer along with the dry ice and hope for the best. When my sister and brother-in-law arrived, we thought that it would be safer to break out the Culinary Circle Chocolate Truffle Gooey Fudge Brownie Ice Cream Dessert. Yum. The power came on as we took our first bites. Ah, the magic of ice cream. We saved the frozen yogurt for the next day -- a treat we would enjoy with my parents when they arrived the next day. With four quarts of frozen yogurt, we were quite sure there would be enough for all six of us to enjoy. 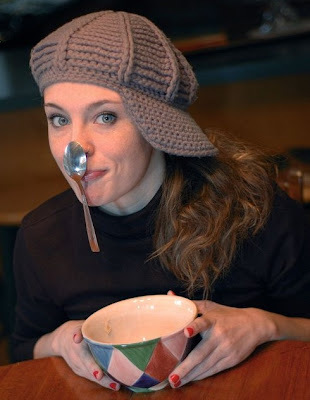 With spoons in hand, larger spoons in the carton, and large dishes, we proceeded to taste and discuss. There's been a middle school concert and on the way home, the family stops at Friendly's. I don't remember what anyone orders, except my older sister, Sarah. Peach. As is tradition, we pass our cones around, tasting each others' flavors, just to confirm we chose the right flavor...the chunk of conversation I recall ensues. Dad: "Lemme try peach, Sarah..."
From the peanut gallery of the three of us sisters: "Ewww!" "Dad!" "How do you KNOW what dirty socks taste like? Gross, Dad!" To this day I can't see peach ice cream without automatically thinking of a pair of dirty socks. Thanks, Dad. Kevin: "I'm eating strawberry, but it tastes like lemon." Dad: "No, strawberry tastes like strawberry...I like the strawberry." Dad: "I like the vanilla." Dad: "Peach is the most distinct." Overall, there was a feeling of liking it, though no commitment to buying it in the future (with one exception, to be discussed below), but this is perhaps because I do come from a family of ice cream purists, who would choose ice cream over frozen yogurt any day. Besides, the dirty sock review from years before kind of ruins my dad's taste bud creds. 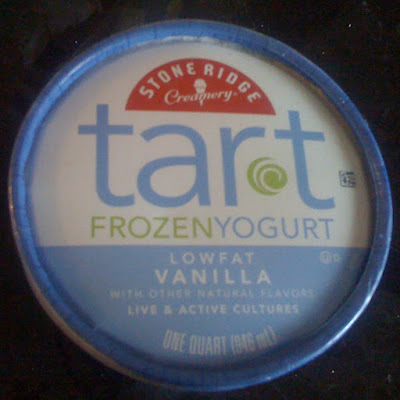 Sarah and I (who have never once compared any frozen treat to dirty socks) polished off the vanilla over the weekend, with a promise of buying Stone Ridge Creamery Vanilla Frozen Yogurt again in the future. We had made a fruit salad earlier in the day, and fell in love with the vanilla topped with a mix of peaches, strawberries, cherries, blueberries, and cherries. Summertime perfection. Additionally, all agreed that any of the above flavors tasted good topped with the family tradition of sugared summer berries. Looking out the window at the rain that has been falling heavily for the past three days, it's hard to imagine spring is days away, but since it's not snow, the future looks warmer. This being the case, I see cartons of Stone Ridge Creamery Vanilla Frozen Yogurt piled high with fruit just around the corner. Stay tuned for Part 2 of this review by Kevin, the newest member of our blogging team! New monthly post...Scoopalicious will find one of our favorite brands or local shops and highlight a favorite flavor of ours, a special offering of theirs, or just something plain good. This month its the shop with the famous 31 flavors, Baskin Robbins. In honor of the looming tax deadline, B&R has named a Flavor of the Month, Tax Crunch. Its their Kona Coffee ice cream blended with swirls of cracklin chocolate and rice crispy pieces. Being a Rhode Islander, home of the famous Autocrat coffee syrup and where coffee ice cream is a must, this flavor is right up my alley. The mix of the coffee with chocolate crunch and crispies is fabulous and one that will definitely take my mind off tax season. Stayed tuned for April's Flavor of the Month.